Information - The Regal Tang Distribution: Indo-Pacific from East Africa to Japan. The Regal Tang, aka Blue Tang, Blue Surgeonfish, or Indo-Pacific Blue Tang. 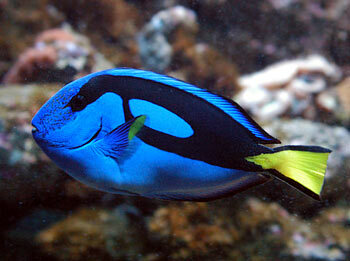 The Blue Tang Dory is a friend of Nemo in the recent popular cartoon movie "Finding Nemo". Friend of Nemo in the popular cartoon movie! Siteseen Ltd. are the sole copyright holders of this Regal Tang Tropical Marine Fish picture, unless otherwise stated. We only authorise non-commercial picture use and particularly encourage their use for educational purposes. This Regal Tang Tropical Marine Fish picture is not in the Public Domain. 3) Use of this Regal Tang Tropical Marine Fish picture, or any of our pictures on websites re-distributing copyright free material is strictly prohibited.